Installing a walk in tub in your bathroom can make your bathing experience a safer and more enjoyable one. Whether you have difficulty lifting your legs over the edges of a traditional bathtub, or are worried about the possibility of slipping and falling in your bathroom, the Jacuzzi® walk in bathtub systems offered at L.J. 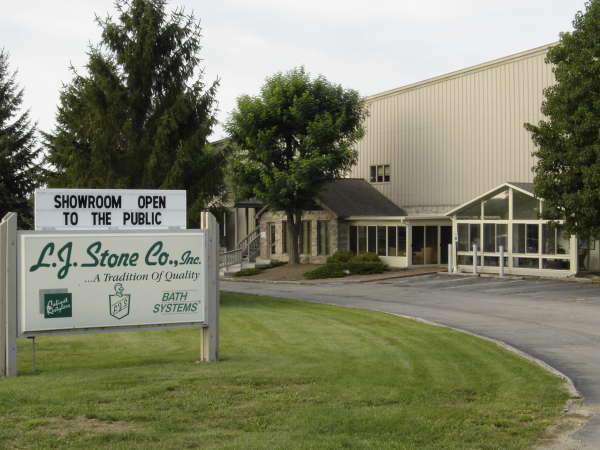 Stone Company, Inc. provide homeowners with a safe alternative to bathing in traditional bathtubs. All of our walk in tub products feature a patented, leak-free door that allows for easy entry and exit from the bathtub, without the danger of tripping over bathtub sides. If you have limited mobility, installing one of these safety tubs will allow you to comfortably bathe while seated, eliminating the fear of slipping and falling on wet surfaces. Additionally, these walk in tubs are designed to allow water to fully engulf you up to and beyond your shoulders, which provides a soothing, muscle-relaxing bathing experience. Since 1967, residents of Noblesville, Anderson, Marion, Richmond, and other communities throughout central Indiana have depended on L.J. Stone for a number of high-quality home improvement products, installation, and service. In addition to our Jacuzzi® walk in tub products, we also sell and install tub-to-shower conversion products, bath and shower liners, exterior entry doors, radiant barrier insulation, gutter protection systems, insulated vinyl siding, replacement windows, and more. For more information about our safety and handicap bathtub products, or any of our other home improvement solutions and services, contact L.J. Stone today. We happily serve homeowners in Greenfield, Greenwood, New Castle, Portland, and all other communities throughout the greater Indianapolis area.